Following on from the previous post PLACE TO BEE – campaign promotes public awareness of local biodiversity, read how one Irish boy’s drawing for biodiversity has gone global! Nine year old school boy Lorcan Wallace (now 13), from Poulacapple National School, entered a ‘B 4 Biodiversity’ children’s art competition run by Waterways Forward project partner, South Tipperary County Council’s heritage office, as part of the process of compiling the South Tipperary Biodiversity Action Plan in 2009. His illustration features in the Plan and on the county council’s online library of entries. 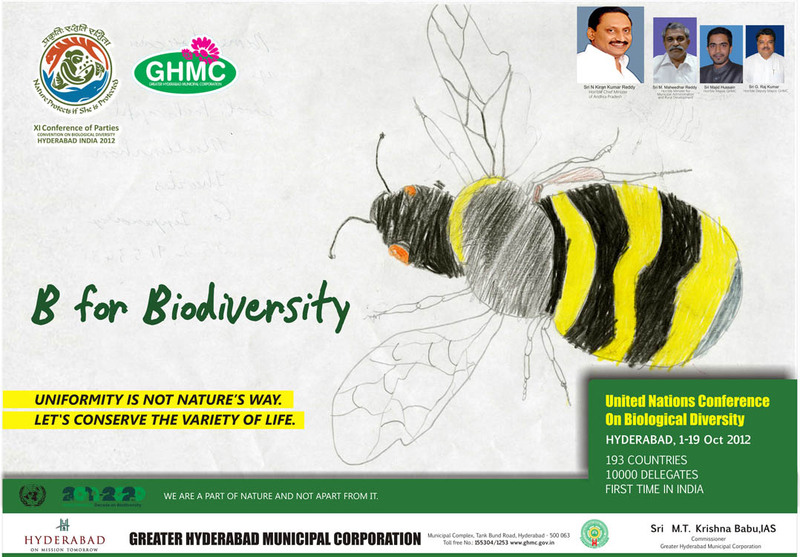 Lorcan’s efforts for biodiversity are now being seen across the globe as his ideas have helped launch the United Nations Conference on Biological Diversity held in Hyderabad 1-19th October. His drawing was chosen as it shows ‘the passion of the little brain on biodiversity’. Lorcan is the son of organic farmers and this has fostered his passion for biodiversity and nature. An exact replica of his drawing, including evidence of his initial erased attempts, was then erected on 10 billboards throughout the city.